Save time! 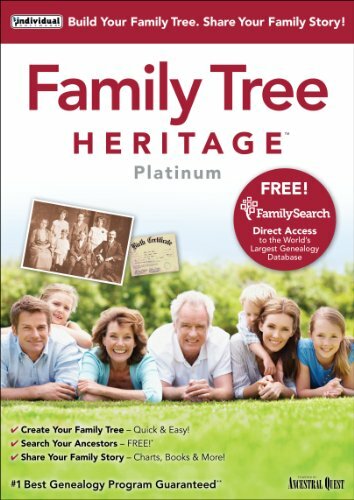 Family Tree Heritage makes searching for ancestors and creating your tree easy. Find records and important documents for your ancestors with one click for seamless searches to the world’s largest genealogy database. Create colourful trees, heirloom-quality charts, reports and family books that will be cherished by your family members now and in future years, with Family Tree Heritage’s genealogy design tools. Uncover new information about your ancestors. The research timeline helps you uncover clues that will assist you in researching your family history by uncovering events in an ancestor's lifetime. These events may have affected your ancestors, such as a war or immigration issue, and they can point you to additional resources to help you learn more about your ancestors. You can create your own set of Tags and assign up to three Tags to the various individuals in your database. This is a popular and useful new feature among genealogists. The tags display on various screens and reports in Family Tree Heritage. Easily identify individuals and family lines. This four colour filing system has gained popularity with genealogists over the past few years. This feature allows you to add background colours to the name boxes for individuals and/or family lines. The colour coding will display on various screens and reports, allowing you to easily track individuals from both the maternal and paternal sides of your mother and father’s ancestors. Enhanced Fan Chart with colour coding, you can now generate a Four-Colour Fan Chart and include siblings in the first generation of the chart.